As the end of another school year approaches, we have been deliberating how best to address the state of curriculum in D181. Over the last three weeks, the D181 administration released the MAP scores, presented their interpretation and excuses for yet another year of declining individual student performance data and then, using brand new criteria/cut-off scores, released placement decisions for next year's 6th grade students into the middle school math, language arts and social studies tiers. Between all of us bloggers, we have attended or listened to the podcasts of the last two board meetings and the May Learning Committee meeting, and we have concluded that D181 has come full circle in the curriculum mess that led to hiring Dr. Moon five years ago to do an assessment of the gifted programs. We have concluded that D181 is no better off, in fact we believe it is worse off, than it was in 2011 when the Department of Learning began leading the district down the socially just/learning for all pathway to nowhere. Long before the district hired or promoted the last five DOL administrators --- Stutz, Russell, Benaitis, Schneider and this year's 2 interims -- D181 had dedicated gifted and advanced learner programs both at the elementary and middle school levels. GRC, and later ACE, were the names of the previous gifted programs. In addition, starting in elementary school, there was math compacting and acceleration offered to the highest achieving math students and by the time they got to middle school, there were 3 levels of math (one or two years acceleration), 2 or 3 levels of language arts and 2 levels of social studies. These programs required placement based upon students achieving certain cut-scores on either of or a combination of cognitive and achievement tests. The cut scores were chosen by the DOL administration and seemed to change year after year, depending on who was running the department. The problem with the past programs, however, was that students who just missed the cut-offs were not really afforded an appeals process and were rarely added to a higher tier. That is, unless they were grandfathered into the programs with scores they had received in second grade that placed them into GRC/ACE, even if those scores were well below the cut-offs needed for new students to place into the programs going into middle school. Five years ago, in 2011, Dr. Moon was hired to evaluate the gifted programs in D181. Her conclusions included: D181 was committing educational malpractice, gifted students were only having their needs met on a part time basis , the identification process for placing students into the gifted or advanced tiers was flawed and needed to be changed to allow more students an opportunity to be successful, and district wide there was not appropriate differentiation taking place in the general classes. Following Dr. Moon's report, the district embarked on a "journey" (to use Dr. White's favorite phrase) under Dr. Schuster's leadership to develop a new philosophy of learning, which ultimately led to Dr. Schneider's and the DOL's creation and implementation of a socially just Advanced Learning Plan, which then morphed into the Learning for All Plan. During the Learning for All years, "gifted" became a dirty word in D181 and was replaced with various iterations such as "advanced learner" or "unique learner." The gifted programs were stripped down and a one size fits all/acceleration for all model replaced it. All students were accelerated one full year in math, and a seven year plan was presented that once fully rolled out would have all students taking ACE social studies and ELA. This seven year plan was pushed by the DOL despite concerns raised by some teachers that such a plan would lead to watering down of the curriculum or would simply be too difficult for the average or below average students. Teachers were tasked with effectively differentiating all instructional levels within their classroom. In addition, under the plan, as the seven year roll out began, students could opt in to any of the upper level programs in the middle school regardless of their placement scores. Rather than work on fixing the broken identification process, the administration (in our opinion) simply opened the floodgates and let anyone in who wanted to try the upper level tiers. For those of you who have followed the discussion on required student performance to stay in the upper level classes, you will remember that over the years, students went from having to maintain an 80% in the classes to only a 70% and then could actually stay in the class if parents insisted, regardless of the student performance. As we now know, the acceleration for all model didn't work. The differentiation of all students within one classroom didn't work. The dismantling of the gifted program didn't work, and the Learning for All Program didn't work. Each year the new fangled socially just curriculum program rolled out culminated in a growing awareness that student performance was declining in most schools and over most grades. Certain schools and grades did show good performance but the administration did not undertake a real analysis of what was working at those schools that should be implemented in the schools/grades where performance was tanking. Year after year for the last five years, the MAP scores have declined. Year after year the BOE and the community have listened to a series of excuses from the administration as to why this might be. From a change in achievement tests given statewide, to a change in norming standards on MAP, to growing pains from implementation of common core standards, to the challenge of implementing new math materials, there was always an excuse given. Yet what was missing was any attempt to truly collect or analyze not only the test data but class work data, to understand the performance decline and make the necessary adjustments. In the Spring of 2015, the new BOE members finally demanded change. Even without the real analysis of why scores were going down, they recognized that the Learning for All program wasn't working and student performance was declining, especially in math. The BOE directed a reinstatement of math tiers. The administration pushed back and after nearly one year, the board directive hadn't been fully implemented. This spring, teachers began speaking out about how the programs have either been watered down to make them easier for the average learners or if not watered down are too difficult for many students. If one listens to the meetings, you will hear reports from teachers of students crying because they are so stressed out from the higher level work. You will hear them say how materials have become so watered down due to the opt-ins, that the courses are no longer challenging the highest achievers. And throughout all of this, one can look at the student performance data and see that has continued to decline. The teachers are now seeking placement changes, especially in ACE social studies and ELA. Listening to the teachers, it is clear they want a return of tiered programs so that students can be taught at their appropriate levels. But the problem with a return to tiered programs is that one must have an appropriate identification process to properly place students. So has the identification process been fixed? No it has not. Listening to the May 16 Learning Committee meeting, there was extensive discussion of how the DOL had to come up with new cut-offs this year. Unlike last year when cut-offs were based on a combination of scores from the Inview test (a cognitive test) and MAP tests (achievement tests) this year, Inview was eliminated, leaving only MAP scores. In addition, for language arts and ACE social studies, students took a writing narrative assessment graded by the sixth grade ELA teachers. Apparently there was confusion by the DOL administration as to what exactly the BOE was looking for in terms of placement of students into the math, language arts an social studies tiers. But rather than go before the BOE to seek clarification, the DOL took it upon itself to simply start adjusting the cut-off's until it achieved class sizes that it thought would balance the interests of the BOE, administrators, and teachers. We are not going to detail the Learning Committee discussion, but suffice it to say that it is clear that rather than select cut-off scores based upon an analysis of student performance in the classes and the corresponding MAP and narrative writing sample scores achieved by successful students, the cut-offs were tweaked to fill seats. There was no scientific analysis done of student performance to determine what the appropriate cut-off scores should be. In fact, during the committee discussion, there was talk of possibly further manipulating the cut-offs to get to a desired number of students for each level. But worse than this was the insistence by the DOL administration that it was very difficult for them to set the criteria without there being a philosophy of learning in the district on how to treat gifted students. SAY WHAT? Did the DOL administration really say this? Yes they did and to us this was a sign that everyone in the DOL has dropped the ball big time. How could any administrator not know about the PHILOSOPHY of LEARNING that the BOE approved less than five years ago? And IF the DOL administrators really believe that there is no philosophy of learning, why the heck didn't they go before the BOE to ask before deciding on the placement criteria it thought would balance all interests? When we listened to this discussion we were horrified. Not only hadn't the BOE been consulted about the methodology the DOL was using to set the placement criteria, but the teachers who were consulted and who had voiced their concerns, came to the meeting to express their shock that the criteria had been changed from what they had been led to believe the cut-offs would be. But instead of the committee insisting that no placement decisions should be sent to parents until after the BOE could address the DOL administrator's questions, and clarify what the philosophy of learning, philosophy of gifted, directives and intentions of the BOE actually are, the learning committee further "tweaked" the placement criteria to tighten the ACE social studies criteria to address the teacher's concerns, even though it would lead to much smaller ACE classes than the last couple of years. What amazed us as we listened to the discussion was that it was almost as if the DOL administrators and certain committee members were prepared to manipulate the data to suit whatever the "flavor of the day" by the DOL administration or certain committee members decided that evening to sample. And two days later, placement letters were sent home to parents without first discussing any of this with the BOE at the May 23 meeting. So we waited to see whether or not there would be substantive discussion by the BOE on either the MAP data or the placement criteria at the May 23rd board meeting. Both items were on the agenda. But after cursory presentations on what had been discussed at the Learning Committee meeting, the BOE didn't have much of anything to say on either topic. WOW. We were shocked. And we remain shocked and concerned. As we sit here writing this post, there is absolutely no way that the administration or BOE can say that the identification process it is using for next fall is appropriate, based on research, will ensure proper placement of students into their correct level, will not change next year when the DOL or someone on a committee wants to change it, and will not be subject to change up or down depending on the desired class size. Is this what Dr. Moon meant when she said D181 needed to fix the identification process? The district has now reinstated tiers that it was quick to eliminate under the Learning for All Plan. The DOL administrators are now once again using the phrase "gifted" students. The ACE program which five years ago was criticized for being too small and excluding students who just missed the cut-off, is now once again going to be very small and subject to tight, restrictive cut-offs. So like we said at the beginning, we have come full circle. Yes, now there is an appeals process, but it is subjective. So we anticipate that there will be claims of unfairness and claims that not all students who could succeed are getting the opportunities to try the higher level work. And at the end of the day, we won't be surprised if a future board or administration suggests hiring another consultant to assess the state of the tiered programs. And the identification process. And the cycle will start all over. And nothing will have really changed, except that student performance will have steadily declined over the years. Comment of the Day #2: Jay Wick's Summary of Last Night's Roundtable Discussion on HMS Next Steps. We have just received a comment from Jay Wick describing the Round Table discussion that took place at Prospect School last night on HMS Next Steps. Thanks Jay Wick for sharing your observations. If anyone else attended the Round Table discussion last night, we'd love to hear from you too! There were parents and community members from throughout the district at the Tuesday night "roundtable" for "next steps". The consensus from all in attendance was if there is any hope of replacing the existing middle school the cost has to be MUCH LOWER, the need based on more quantifiable metrics, and a design that will not lend it self to an "arms race" of additional spending requests. Thoughtful community members who make their living in fields like higher education / research shared the fact that they routinely construct world class facilities with cost per sq ft far below the amount sought in the failed referendum. Whatever challenges there might be with the existing site and a lengthy construction schedule that arises from a desire to have students use the existing facility while its replacement is constructed around it must be factored into how accepting the broader electorate will be toward such choices; simply put the desire to retain the tradition / convenience / grandeur of the downtown Hinsdale site cannot also come with a perception that those families attending the district's other middle school will soon clamor for "matching upgrades". Taxpayers in our communities are exceedingly sensitive to the needs of all taxing bodies and the overall miserable fiscal mismanagement of Illinois, any effort to convince voters to back a voluntary increase in the amount of taxes extracted from them has to come with extraordinary levels of evidence that expenditures will be managed prudently.That has not happened thus far! It was frustrating to hear some community members who are either cluelessly unaware or simply refuse to acknowledge that even with the current state of the middle school in Hinsdale, their attendance area is still more desirable than any part of either the overall district or any neighboring areas -- one need only look to Elmhurst, Oak Brook, Downers Grove, or the portions of Burr Ridge outside of the district and see that home buyers in those areas are not running from those "schools of inferior design". For perhaps the sharpest contrast of how little some buyers care about school layout one need only look at the portions of Oak Brook served by Downers Grove schools, in particular there are multi-million homes being built and sold in the area that attends Belle Aire, a school that to this day lacks any sort of interior walls. The restrictions that such a layout imposes on learning are no doubt far more challenging than anything at a facility that has been extensively retrofitting multiple times, as has HMS, yet buyers still spend their money to live in Oak Brook. The "do this or your property values will suffer" argument is thus easily dismissed. What is true is that the district does need to come together. The current HMS forces unacceptable burdens on those who use it, the continuing financial resources that it drains from the district in elevated maintenance and portable rentals is a disgraceful waste that should not be tolerated. Some folks seem to believe that stacking up numbers higher and deeper than their opponents will lead to compromise, that however is nothing but a recipe for continued inaction. True compromise must acknowledge the legitimate concerns that sent the last proposal to the rubbish heap. The results of both the scientifically conducted phone survey and the less formal online survey clearly show a desire for NEW PROPOSAL. Start over. I was encouraged that parents from the HMS attendance area felt good about positive comments from parents in the CHMS attendance area, anyone who has been inside HMS readily acknowledges how inefficient it is. Hopefully some one with the desire to see a new school constructed can carefully benchmark how much time is wasted by students and teachers traversing the treacherous layout. Ideally that would be compared to the more compact CHMS. That sort of true cooperation is desperately needed to move the district forward. Comment of the Day: In the News! We have just received the following comment that we are posting as our Comment of the Day. As the author states, we'd love to hear from you on the issues raised in the newspaper articles. So SOUND OFF! As the school year winds down, we will be writing our final posts before signing off -- permanently. When the 2015-2016 school year ends, we -- the bloggers -- will have officially graduated all of our children from D181 and have decided that now is the right time to end our blog. Our hope is that current and future parents will continue to closely monitor what is happening in D181 and, if necessary, start their own blog that will continue to shine a light of transparency on the good and the bad in the district. We will elaborate further on June 9, when we will be publishing our final post, but today and later this week, we are going to publish 2 important posts. 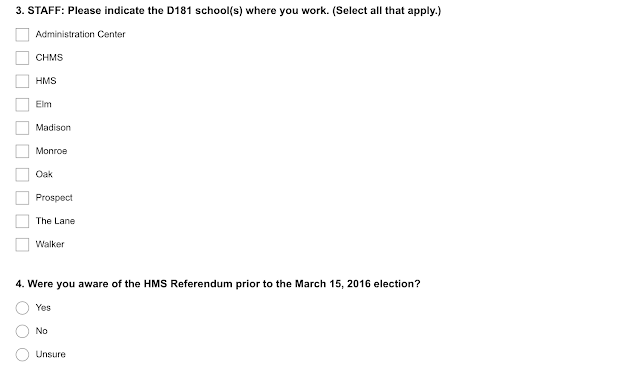 This first one addresses the HMS Referendum Next Steps Survey Results. Later this week, the second post will address Curriculum Issues that were discussed at last week's Learning Committee Meeting and will be discussed at tonight's BOE meeting. At tonight's BOE meeting, the HMS "Next Steps" Survey results are on the agenda for discussion. As you all may recall, following the failure of the HMS Referendum, the BOE tasked the administration with conducting a survey, the purpose of which was to determine why the referendum failed and whether or not the BOE should approve going to referendum in the future on the HMS building. What we plan to do instead of summarizing the reports is to provide you with our take-aways (and of course, they are opinions which you may or may not agree with) and the next steps we hope the BOE will take, starting tonight. 1. It is clear that the main reason that the referendum failed was the exorbitant price tag. It is also clear that in order for an HMS referendum to have any chance of succeeding, the price tag must be below $45 million. 2. Too many bells and whistles were included in the first referendum, but in our opinion, even if you strip out the auditorium and running track, that will not lower the price tag by $20 million, so other changes are needed to the "winning Cordogan design." 3. There is insufficient interest in rushing back to referendum in November 2016. A majority of survey takers want the BOE to either take as much time as is needed to develop a design that the community will support or at a minimum wait until April 2017 at the earliest. It will be interesting to see if the administration attempts to spin the responses to suggest that enough time exists between now and November to develop a design that the community can support and approve less than 6 months from now. More importantly, it will be interesting to see if the BOE falls for this spin or immediately quashes any notion of going to referendum before April 2017. 4. Based upon the survey results that show that a new design is in order, Cordogan must be terminated as the Architect on an new HMS project. Unfortunately, for Cordogan, they have already had multiple swings at bat to design a new HMS that would cost $45 million. As past blog posts have reported, their original design came close to a projected cost of $45 million, but a last minute bait and switch escalated the price tag by 66% to $73 million. While they generated several project modifications that lowered the $73 to $65 million, $60 and $55 million, it was clear from the presentations to the BOE that the architecture firm was not supportive of their "cheaper" versions. How then could anyone trust them now to develop a cheaper design that the community will support? 5. We hope that all of you will take the 30 to 45 minutes it will take to read the COMMENTS submitted by the community members on the Online Survey: Online Survey Results with Redacted Comments. While the comments are consistent with the Survey results, we do want to take a moment to express our sadness and disappointment in community members who suggested that the only reason Clarendon Hills residents voted NO was because they didn't think they would benefit from the referendum. There were many negative, personal comments against Clarendon Hills residents and we found them to be ignorant, hateful and destructive. Thankfully, as the data shows, more than 50% of those who took the online survey actually live in the HMS feeder areas within D181 and the majority of the comments were from people who voted No AND gave very detailed and substantive reasons that have nothing to do with which side of town you live on to explain why the referendum failed. 1. Have a meaningful, substantive and constructive discussion tonight on the survey results. 2. Decide that it will NOT go to referendum in November 2016. 3. Terminate it's relationship with Cordogan Clark, the architecture firm. 4. Agree that it will not take any further steps on an HMS referendum until it has finalized and approved its Facilities Master Plan -- just like D86 did as a first step. 5. Set a timeline for finalizing and approving a Facilities Master Plan. 7. Set a timeline for deciding what the MAXIMUM dollar amount that should be spent on EITHER a new HMS OR a renovation of the existing HMS and conduct a formal RFP process to select a reputable architecture firm that must bid on the project as has been done with past successful D181 referenda. 8. Once the winning firm is selected, then work with that firm to design a new or renovated HMS that will be within the budgeted amount. 9. Go to referendum, but only after ensuring that a Committee of Community Members has been formed that will do the heavy labor needed to promote in a constructive, non-devisive manner the referendum question. In our opinion, the earliest this can happen is April 2017, but since the administration has proven itself incapable of meeting ANY deadlines -- whether budgetary, facilities or curriculum -- we doubt that an April 2017 referendum can be achieved. Instead, we hope the BOE takes as much time as is necessary to set a budget, select an architect and design a reasonable and fiscally responsible new or renovated Hinsdale Middle School. We can't wait to listen to tonight's BOE meeting and see if ANYTHING AT ALL is decided on this important topic. Stay tuned and SOUND OFF! Are Nine Years of D181's MAP Student Growth Summary Reports Invalid? Are the Reports D181 has Relied Upon "MISLEADING" and do they "MISREPRESENT" the Growth Summary Data? We begin this post by copying from our last one a statement made by Dr. Larson at the May 9, 2016 BOE meeting. As you may recall, BOE members expressed concern over the Growth Summary data for the Fall 2015 to Spring 2016 MAP data. Over the last few days, as we awaited the posting on Board Docs of the Learning Committee agenda and related documents for its May 16, 2016 meeting, we decided to compile D181's MAP growth summary data for prior years. With a little digging, we found the MAP Growth Summary Data for 2006-2016 on the D181 website and Board Docs. Below is a chart we prepared from the Growth Summary data reports NWEA created for D181 beginning with 2006 - 2007 school year and from which former administrators created Board Reports and D181 schools developed their School Improvement Plans. The following chart*** shows (or so we have always been led to believe) the % of students who met their Growth Targets in Math and Reading since the 2006-2007 School Year. Each of the NWEA Growth Summary Reports and Board Reports/Powerpoint (created by D181 Administrators) that we used to create this master chart have columns or spreadsheet charts that purport to show the % of students meeting their growth projection. Until Dr. Larson's declaration (at the May 9 BOE meeting) that the 2015-2016 NWEA Growth Summary Reports "MISREPRESENT" this information, no one (to our knowledge) in the D181 Administration (past or present) had EVER made such a suggestion. This is important because whatever explanation Dr. Larson gives regarding the mysterious DISCREPANCY, she had better explain whether the DISCREPANCY existed in the past NWEA reports, potentially invalidating the reported results since 2006 that D181 administrators have relied upon and represented to multiple BOE's. What follows is the chart we have created for each grade level, and in our lay opinion, it shows that student performance has declined dramatically over the years -- in particular in Math -- and this year is the worst year in the last five years for a majority of the schools, regardless of the grade level (as highlighted in RED). Dismal MAP Test Growth Results -- Real or Not? Is the D181 Spin Machine Once Again Cranking Up to Avoid Accountability? By now the news is spreading like wildfire across D181. The Fall 2015 to Spring 2016 MAP test Student Growth results are ABYSMAL! Rather than show you images of each page of the report, we have created our own Comparative Chart that highlights the Grade Level Growth for each school. We expect that you will have the same reaction to the results that we did -- one of shock and disappointment in how D181 has let our children down. We begin by reminding our readers that D181 students in Grades 2 through 8 took the MAP test last Fall and this Spring. Each time the students take the MAP test, they are given a projected growth target of how many RIT points their new score is projected to increase from their prior score by. Each student has a different growth target. The MAP Reports D181 ordered from NWEA (the Northwest Evaluation Association) show the percentage of students that met their Projected Growth Target. We have highlighted in RED the lowest % growth target met in each grade in Math and Reading. In looking at these results, the question to be asked is "What percentage of students should be meeting their growth targets?" With the watered down goal from 70% to 55%, parents have a right to expect that the schools at each grade level will meet this growth target. So, there is no question that the percentage of D181 students who met their individualized growth targets for the 2015-2016 school year is unacceptably low. How many schools (7 elementary and 2 middle) had 55% or more of the students meeting their math and reading targets? In 2nd grade, 0 in math and 1 in reading. In 3rd grade, 1 in math and 1 in reading. In 4th grade, 1 in math and 2 in reading. In 5th grade, 0 in math and 1 in reading. In 6th grade, 0 in math and 2 (of 2) in reading. In 7th grade, 0 in math and 0 in reading. In 8th grade, 0 in math and 0 in reading. But worse than only a few schools having 55% or more of the student meeting their growth targets, was the absurdly low percentile seen at some schools and the very clear discrepancy shown between schools. Two examples will show the discrepancy: While 58% of Oak's 3rd graders met their Math growth targets, only 19% of Walker's 3rd graders did. And while 68% of Oak's 2nd graders met their Reading growth targets, only 31% of Monroe's 3rd graders did. How can this be? Same district, same grade, yet shockingly different growth results. And those two examples are just the tip of the iceberg. Our reaction to Dr. Larson's statement is that it appears that the administration may once again be cranking up the old Spin Machine in an attempt to minimize the growth results and deflect attention away from the obvious questions -- the WHY questions -- that would explain how so few of our students are achieving appropriate growth after one year of learning. The HMS Referendum -- The Bait and Switch Continues. Time for the BOE to Cut the Fishing Line. Looks like the HMS Bait and Switch continues. Let us recall.....First the D181 BOE and Administration selected an architect whose "HMS design contest" proposal cost $46 million. Then less than 2 weeks before the BOE had to decide whether to go to referendum or not, the price tag skyrocketed to $73 million. Then at the ninth hour, the architect brought forward three additional proposals with price tags of $55, $60 and $65 million. The BOE majority (with two sane and rational board members justifiably saying NO to the $65 million plan), voted to go to referendum for $65. And guess what the community said? NO WAY! The Referendum FAILED! And, it wasn't even a close vote! So now, as the BOE is trying to decide when and if and at what price tag to try again, the architect has come forward with a new proposal -- one in which it will agree not to be compensated for any more design changes - which per their letter, will only be MINOR --made prior to any future referendum being approved AND in which the firm will agree to lower its Architectural Fees on the whole project in order to get the price tag down to under $60 million. Really? Well, we are not buying it! Check out the letter they sent to "Don" 45 days ago, on March 24, 2016. (That's right -- "Don" has been sitting on this letter for over one month, not publishing it for all the community to read, and to our knowledge, it wasn't published or discussed at the April 11 BOE meeting! The letter is now posted on Board Docs for the Monday, May 9 BOE meeting and can be accessed at: March 24, 2016 letter. As we read the architect's letter, we were, to be frank, beyond disappointed in Cordogan Clark. Why? Let's take a look. The following will quote portions of the letter in blue and then give our reaction in red. "As you know Cordogan Clark revised the design seven times since the competition to continue to find cost savings and we were intimately engaged in every organized activity to present the facts and information related to the HMS referendum and were ready and willing to do more and even offered to go door to door to provide information, and get the message dispersed." Reaction: How comical that they claim they revised the design 7 times to find cost savings! How ironic that they neglect to acknowledge that their original $46 million "winning design" was revised UPWARD by nearly $30 million. The fact that they ignore this apparent "teeny weeny fact" in their letter speaks VOLUMES. In our opinion, they just don't get it! Furthermore, their claim that they were "intimately engaged in every organized activity to present the facts and information related to the HMS referendum" must mean they worked hand in hand with the Vote Yes Committee and Director of Communications. Obviously, they had ZERO influence, since they were unable to convince anyone to conduct the door to door canvassing that they reference. Not once did the community get any flyers from the Vote Yes community group. It just got flyers from Ms. McGuiggan. Why not? Why didn't the architect work to create flyers for the VOTE YES group that were mailed to the community or distributed door to door? It seems that this firm is quick to claim that they would have and could have done more, but the reality is that what they SHOULD have done, they did NOT do. So why trust them now? We sure don't! "As a gesture of our commitment to CCSD 181 and this project, we offer to forgo additional compensation for the efforts related to design adjustments required to bring the project price lower than the $65 million for the next referendum phase. It is our opinion that the current design, with some reasonably minor adjustments, as agreed to by CCSD 181, could bring the project cost down to under $60 million." Reaction: Read carefully what they said. They essentially want to keep the current design with "minor adjustments". No mention of what those minor adjustments might be, no mention how they determined that these unnamed adjustments could reduce the price tag by $5 million. Are they planning to eliminate the auditorium? The running track? What are they talking about? And are they really suggesting that reducing the price tag by a mere $5 million will be all it takes to convince more than 50% of the community to vote yes? In our opinion, this statement is meaningless and cannot be trusted. It is clear as a bell that the community is not just going to accept MINOR changes to the design. Hopefully, the online and phone surveys will show that the community expects not just MAJOR design changes but also a much greater reduction in the overall cost of the project. The refusal by the architect to even consider this possibility in their letter leads us to conclude that they will never work to achieve the community's real goals and desires for a new or renovated HMS. "We believe that the design, which was highly favored by the Administration, HMS staff and the Facilities Committee has inherent efficiencies and can be further refined to realize these savings." Reaction: Are they joking? They claim their own design has ''inherent efficiencies?" And that as a result of these "efficiencies" their plan can be "refined" to "realize savings?" What does that even mean and why should we trust their assessment of their own project that was riddled with cost mistakes from Day One? Simply making this claim does nothing to instill greater confidence in the many community members who didn't fall for the first round of bait and switch and are way too intelligent to accept at face value anything Cordogan Clark now says. Sorry folks, but once you stop laughing at this ludicrous suggestion, you should vent the anger you should be feeling towards this architecture firm and DEMAND THAT THE BOE FIRE CORDOGAN CLARK. "Furthermore, we also offer to fund the cost of an independent cost estimating company which could validate the cost of the revised HMS design that we jointly settle upon and further reduce the negative perceptions related to the previous cost estimate." "Additionally, we are willing to reduce our total fee percentage by a quarter of a percent to 6.4% from 6.65% to further illustrate our commitment that we are the right partner." Reaction: To top off their offer to tweak the design and lower the costs to the D181 taxpayers, the architects also offer to CUT THEIR FEES! Yippee! Hooray! SAY WHAT?????? As we recall, there were concerns raised by board members BEFORE the contract with this architect was approved about the fee percentage they were asking for. Yet, at no time did this firm offer to lower their fees below 6.65%. It is unbelievable that in a last ditch attempt to convince "Don" and the BOE to stick with them as the HMS architect, they are willing to cut their fees now. What D181 taxpayers had a right to expect last December was that the district would hire an architect that was willing to make a profit, but realize that it had to come in at it's low point from the start, if it wanted the community to trust it and consider such a high price tag. The fact that the firm is willing to cut it's fees now only means that they had built in quite a cushion because you can bet your bottom dollar that they will still be making a lot of money if D181 accepts all the things this letter offers. NO ONE should have confidence in Dr. White either! In our opinion, especially after receiving this letter, his recommendation to the BOE should have been to CUT THE LINE with Cordogan Clark and hire a new architecture firm. The fact that he didn't come to this conclusion may require some tough decisions by the BOE, not just to go against his recommendation and fire this firm without Dr. White's approval, but also, to conclude that HIS contract should NOT be renewed when it comes up for renewal in the next 12 months. Below is the text of the D181 "HMS Next Steps Survey." We are publishing this so that everyone can see the survey questions. We encourage our readers to submit via comment to this blog your answers to the survey questions and in particular, any narrative responses you provided. We hope that in the interest of full transparency, the D181 administration and BOE will publish for the community ALL of the narrative responses that are submitted, and do so in un-redacted form. Just in case they don't, this blog will provide a forum for publication of narrative responses our readers wish to share. "As part of the March 2016 General Primary Election, District 181 had presented voters with a referendum question, seeking authorization to sell up to $65 million in bonds for the purpose of building a new school that would replace Hinsdale Middle School. The referendum was defeated by a vote of approximately 56% to 44%. The Board of Education and administration are very interested in hearing community input on the failed referendum, and input on how best to move forward in addressing the school's facility needs. Thank you for taking the time to provide your feedback! Responses are limited to one per person to ensure all respondents have an equal voice. There are several opportunities to share comments. Please do not identify yourself or any individuals in your responses. You will need to click "submit" before exiting the survey to ensure your responses are recorded. This survey will close on Wednesday, May 18. A report on the survey data is tentatively scheduled to be presented to the Board of Education on Monday, May 23. If you have any questions, please call 630.861.4924 or email Director of Communications Bridget McGuiggan (bmcguiggan@d181.org). Information about the District's work in determining the next steps for HMS will continue to be posted on the D181 website: www.d181.org > Our District > HMS Referendum. We have just received the following 2 part comment which we are posting as the Comment of the Day. We encourage all our readers to not only take the Survey, but also spread the word to others that they should take it and answer truthfully and candidly about whether they voted yes or no and then detail the reasons why. We also encourage our readers to attend the Community Engagement meetings, although we are once again curious why it is required that people sign up to attend. This requirement will not only put off some people, but discourage last minute attendance by residents who don't know ahead of time if their busy schedules will permit them to attend. Part 2 of the submitted comment expresses one Voter's opinion on next step. We are posting it here in order to get the discussion going, so as always, SOUND OFF! Where do we go from here? 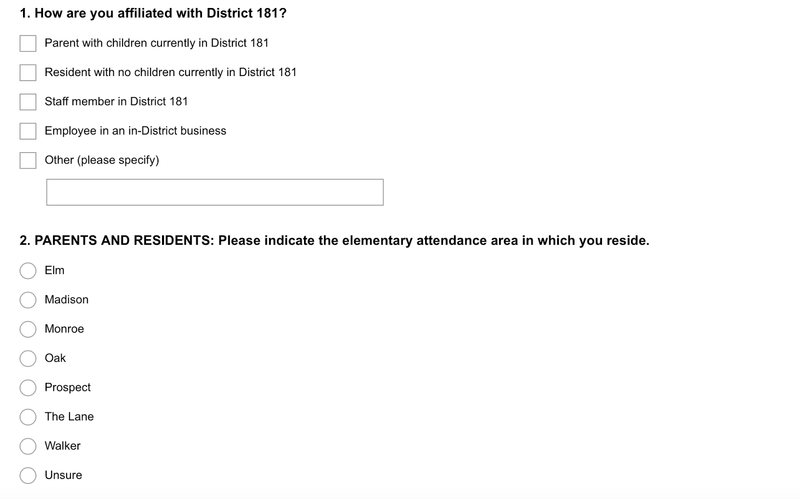 That is the question we are posing to District 181 residents, staff, and local business employees through a new online survey and two upcoming events as we contemplate the next steps in addressing the facility needs of Hinsdale Middle School. We know where we have been. The referendum question asked in the March General Primary Election - seeking authorization to sell up to $65 million in bonds to build a new HMS - was defeated 56% to 44%. We want to better understand why the referendum was not successful, and we are eager to learn what changes should be considered so that any future plan is one our community can support. To that end, together with the Board of Education, I invite the District 181 community to share your input. 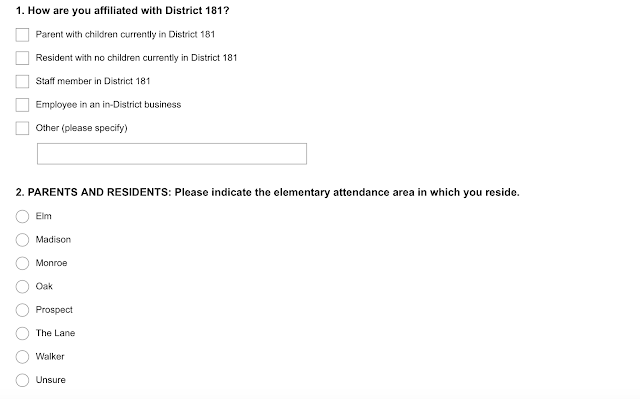 The survey is open now through May 18 and can be accessed at http://tinyurl.com/SurveyOnHMS or from the District website: www.d181.org >Our District > HMS Referendum. Meanwhile, our partner firm is completing calls to 500 residents to capture their feedback. We are also hosting a pair of engagement events later this month. These round-table sessions will be an opportunity to have a conversation about the long-term plan for HMS. Please join us May 24 at Prospect School (6:30pm) or May 26 at our Administration Center (9:30am). We are asking those interested in attending to please RSVP, either online at http://tinyurl.com/RoundTableHMS or by calling 630.861.4924. Throughout the weeks and months ahead, we will continue to listen intently, welcome questions, and share information about this facilities work. Thank you for your continued partnership! I think that it's unwise that the administration is still trying to push a new school, when pretty much the entire DOL will be new next school year. Get the new staff in and settled, and fix the hot mess that is the curriculum first before wasting more tax dollars on a new school. I believe we need to do something with the HMS building, but we have bigger fish to fry right now. Before even looking to architects, decide how many classrooms we need, how big those classrooms should be, what extra places are needed (workrooms, datacenter, staff bathrooms, etc. ), get a list of needs, prioritize wants, and set a firm budget. Some of the things posted on BoardDocs too often stated that the architects didn't know they needed to include in the design. Why the **** not? Also, for somethings like an auditorium, can the district do a crowdfunding page? That way, if they get the money, they'd get it, and the taxpayers who don't want it don't have to pay for it. Also, make it big enough for the entire school, and able to hold all their non-athletic events (music concerts, musical, presentations, etc.). Plus, the district said that the village would pay for a multi-story parking garage. The district should see where else they can fund parts of the school besides bonds/property taxes. Also, regarding parking deck, maybe have it match the height of the school? The school design that went to referendum had 3 floors above grade, and one below. If the village is willing to pay for it, maybe have the parking structure be 3 floors above and 1 floor below grade? That would greatly increase the available parking for the stores around the current site. Plus, after the recoups its money from the parking structure, maybe the village could turn over control to the district and start paying a leasing fee? Another thought I had is learn from the referendums that brought CHMS. Instead of one big school, maybe we should make 2 smaller schools. HMS currently has around 800 kids, CHMS has around 680, so about 1500 middle school students total. Why not have 3 middle schools of 500 each? That way, it'll be easier to know what's fair and parity. I've talked to a bunch of people at both HMS & CHMS. Some of them say that when CHMS first opened, some parts like the gym and music rooms were already too small. If we build a new school, how do we go about that? On the one hand, if we make them proportionally sized to CHMS, that screws over the people who go to the new school. If we make the appropriately sized, that screws over CHMS students. So do we screw over everyone, or have as many people as good as possible, even if it's unequal?"